Deanna (Dee) Bailey outside the Parking and Transit Services office at Skytop. Fittingly, Bailey’s first experience with 38,000 people was New Kids on the Block. Even with her decades of experience, Bailey approaches her work with enthusiasm. Tony Callisto, senior vice president and chief law enforcement officer, admires her dedication. “With nearly 30 years of service to the Syracuse University community, Dee Bailey has the wide-eyed vision of excellence and excitement toward her work and service, as if it were her first day on the job every day,” he says. While Bailey has extensive institutional knowledge, Callisto says she is always willing to try something new and innovate. “One of the most impressive, successful efforts was improving the guest experience for events at the Chancellor’s house, when Dee led in the development, execution and on-site management of a plan to offer valet parking,” he says. Bailey’s day-to-day activities center mainly on helping people, either her staff or customers. 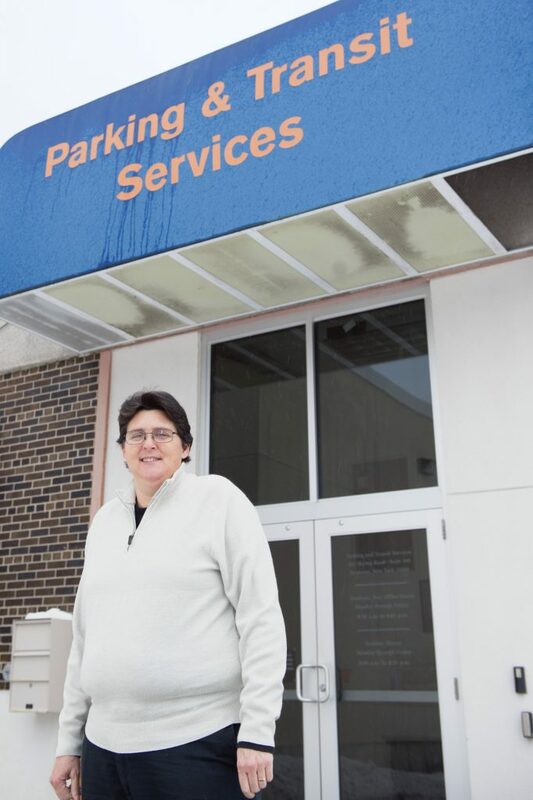 She coordinates and leads daily field operations for parking and manages all event parking on campus. Additionally, she works with local bus companies and coordinates bus orders for Dome events. “Dee’s expertise in planning for, and direct management of, major events, with tens of thousands of people coming to campus, is often unnoticed because of the lack of problems experienced by those arriving and parking,” Callisto says. Bailey works in all weather, from driving rain to bitter cold. Carfi recalled a specific example of her tenacity: “It was probably a game, it was one of the football games where it was just…it just rained all day and all night, and Dee was out there with those people getting drenched,” he says. Bailey has a unique perspective about dealing with bad weather. “You can be miserable or you can say, ‘Hey, let’s see who I’m going to meet today,’” she says.